Naampa ransomware uses sophisticated techniques to infiltrate computers and hide from its victims. Use Reimage to determine whether your system is infected and prevent the loss of your files. The ransom-demanding message is written in the Russian language. Thus, Naampa virus is aimed at Russian-speaking computer users. Crooks ask victims to contact them via unlckr@protonmail.com email address. In the letter, they have to provide one of the encrypted files and key.res file. If victims do not receive the answer within a day, they need to check current email address via provided address using TOR browser. Instead of communicating with cyber criminals, you should remove Naampa from the PC and try alternative recovery methods. It may not be effective and help to decrypt all of your files. But it’s the only safe option at the moment because ransomware is capable of deleting Shadow Volume Copies of the targeted files. However, criminals are not reliable people, so you should not waste your money and obtain suspicious decryption software. 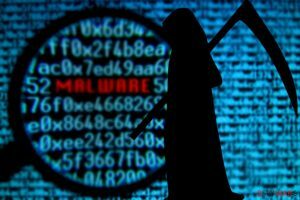 According to the current data, the virus might be related to Unlock92 ransomware virus that has been attacking Russian-speaking people at the end of 2016. This crypto-malware is decryptable. Thus, it’s decryptor might help to recover your files too. Talking about characteristics of the Naampa ransomware, the virus is written in C# programming language. On the affected device malware drops two executable files – naampa.exe and mmspert.exe. These files are responsible for activating the virus and carrying out other tasks on the computer. Deleting these files manually is not safe. Manual elimination of the ransomware might cause even bigger damage to the device. 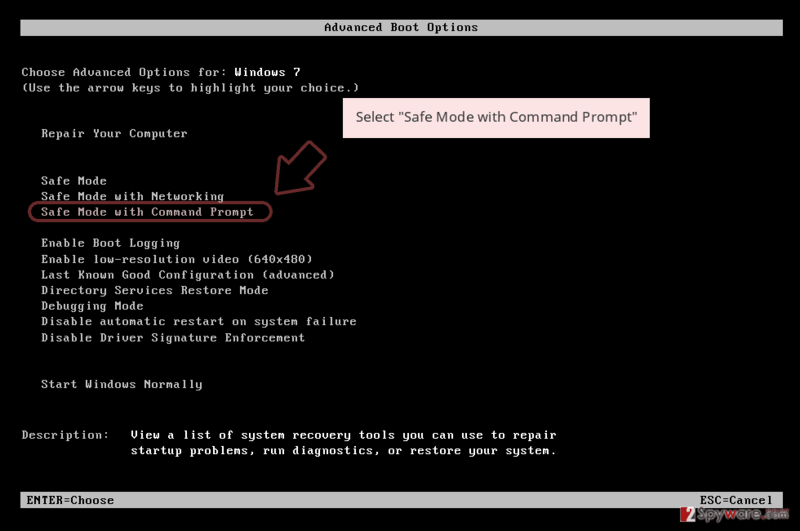 To stop malicious tasks on your computer and fix other problems on the system, you need to run professional security software, such as Reimage. It’s necessary for safe Naampa removal. If ransomware blocks removal tool, please check elimination instructions below the article. 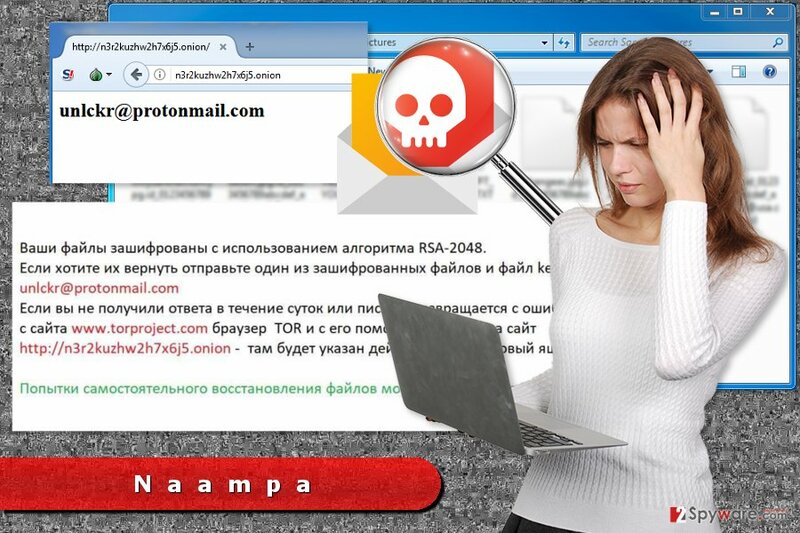 Naampa ransomware virus aims at Russian-speaking computer users. When you open an unknown email attachment, click on a suspicious advertisement, download illegal programs or other content or you are tricked to install a fake software update, you risk to let Naampa or another ransomware virus on your PC. Thus, be careful! As we have already told you, Naampa removal is performed using security software. If you do not know what malware removal tool to choose, we suggest using Reimage, Malwarebytes MalwarebytesCombo Cleaner or Plumbytes Anti-MalwareMalwarebytes Malwarebytes. These professional programs will detect and delete all malicious content that might hide in your computer. 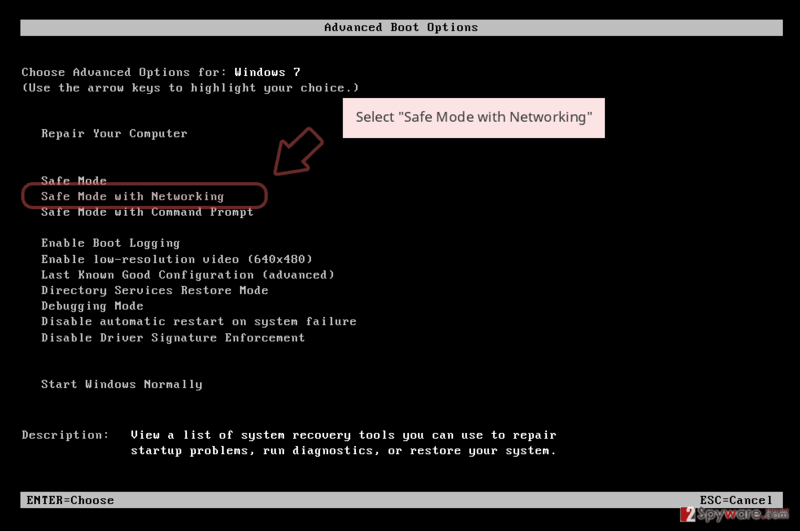 However, if you cannot install, update or run your preferred virus elimination software, you need to reboot the device to Safe Mode with Networking. 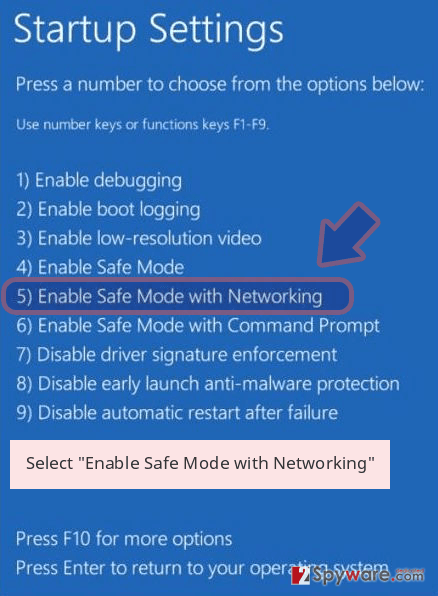 This helps to disable the malware. Then you will be able to run security software and remove Naampa. Log in to your infected account and start the browser. Download Reimage or other legitimate anti-spyware program. Update it before a full system scan and remove malicious files that belong to your ransomware and complete Naampa removal. This method also helps to enable the virus in order to access security software. 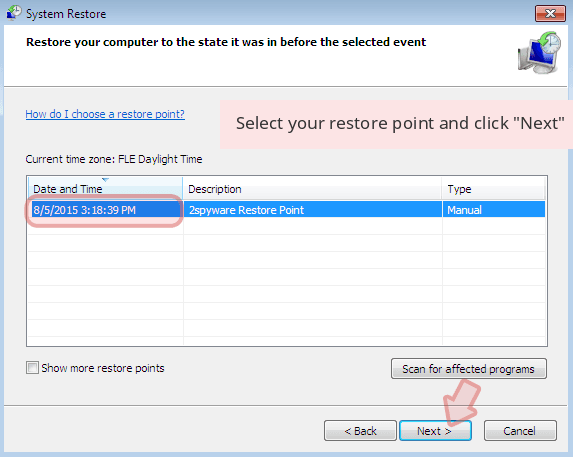 When a new window shows up, click Next and select your restore point that is prior the infiltration of Naampa. After doing that, click Next. 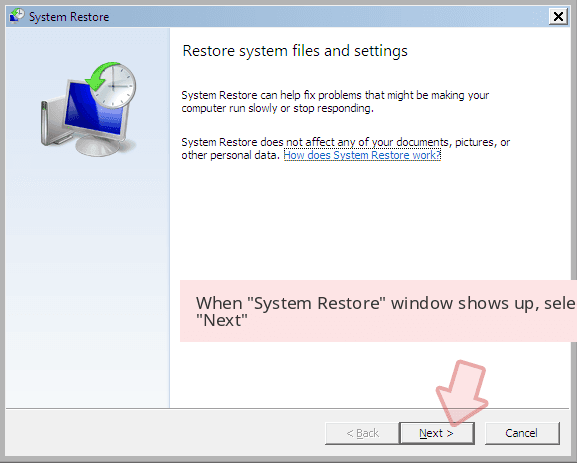 Once you restore your system to a previous date, download and scan your computer with Reimage and make sure that Naampa removal is performed successfully. Guide which is presented above is supposed to help you remove Naampa from your computer. To recover your encrypted files, we recommend using a detailed guide prepared by 2-spyware.com security experts. This method helps to access previously saved versions of files before ransomware attack. 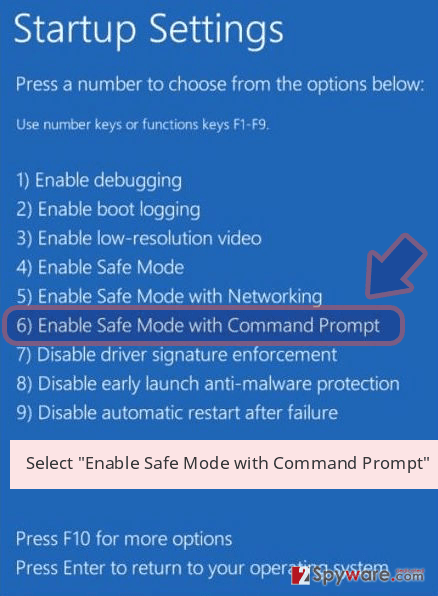 This method works only if System Restore has been enabled before the Naampa hijack. Naampa decryptor is not available yet. ^ Bedynet. Bedynet. Russian website about computer viruses that provides malware removal tutorials. ^ Unlock92 Decrypter. Bleeping Computer. Website about recent computer viruses. ^ Exploit kits remain a cybercrime staple against outdated software – 2016 threat landscape review series. Microsoft TechNet Blogs. 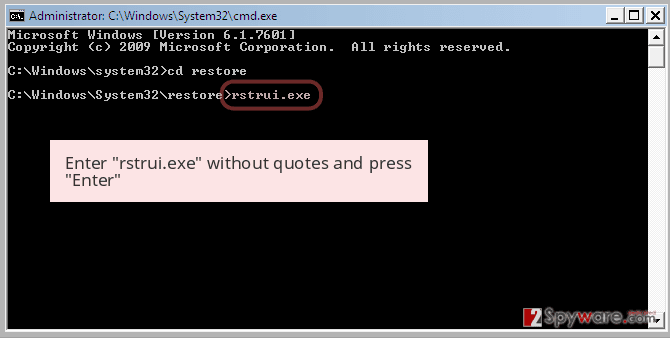 The new Microsoft Malware Protection Center blog. ^ Kayla Thrailkill. New Ransomware Targets Illegal Downloaders. PC Pitstop TechTalk. Everyday PC Tech, Tips, and Tricks. This entry was posted on 2017-07-19 at 05:06 and is filed under Ransomware, Viruses. You can quickly scan the QR code with your mobile device and have Naampa ransomware virus manual removal instructions right in your pocket. How did you remove Naampa virus?